New Palestine, Indiana, is a small town in Hancock County, about 20 miles from Indianapolis on US-52. This quaint community is located in the Sugar Creek Township, with an approximate population of 2,055 and was incorporated in 1871. The first buildings went up in 1938, a school and three churches. Shortly after a department store opened. A restaurant built in 1846 still stands today on Main Street. This small town boasts the Sugar Creek Township Park. The park included two shelters for gatherings, playground equipment for the children, and Frisbee golf course. Part of the park is used for soccer fields and a fitness trail was recently added. Golfers will be delighted with the 18-hole golf course that offers something for every level. The 248 acres course has creeks and ponds that come into play on six holes. A driving range, as well as practice facilities, are included beside the Pro Shop and café. Being so close to Indianapolis offers additional amenities. The Indianapolis Repertory Theater and the Indianapolis Symphony both offer opportunities for great performances. Lovers of sports will enjoy the Indianapolis Colts games. And it is just a short drive to the Indianapolis Zoo for a great family outing. For a great outdoor adventure, the Indianapolis Canal Walk will not only give you some peaceful time in a beautiful area but if you want a little more activity, they have gondolas, kayaks and paddle boats you can use. The real estate in this small town reflects both its history and its growth. In established neighborhoods, you will find older ranch style and cottage style single-family homes of different sizes. Most have mature trees and nice sized yards. Newer neighborhoods feature the newer more contemporary homes, with three to six bedrooms. They also have nice yards. Many areas of the town are still considered rural, with homes near farmland. 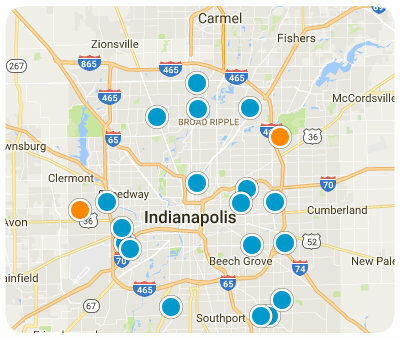 With the local amenities, the beautiful scenery, and the proximity to all the cultural and sports events in Indianapolis, this is a must-see destination for home buyers searching in the Indianapolis area. If you would like more information on homes for sale in New Palestine, Indiana, please contact us today and allow us to assist you. Listing courtesy of Sugar Creek Real Estate, Llc. Listing courtesy of Heroes Property Group.